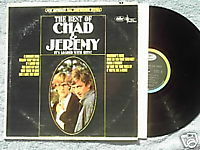 Best of Chad and Jeremy. Capitol ST 2470 (1966) Stereo LP; Chad Stuart and Jeremy Clyde of 1960s British Invasion. Best of includes A Summer Song, What Do You Want With Me, Too Soon My Love, Only Those in Love, Like I Love You Today, Willow Weep for Me, My How the Time Goes By, Yesterday's Gone, If You've Got a Heart, From a Window Vinyl is excellent; cover is VG with some writing on reverse; rainbow label.